There are plenty of reasons to love the Jackson 5: great pop songs, outstanding vocals and Michael Jackson's boyish charm. Their clothes, however, have never ranked as one of our favourite things about the group. Still, that hasn't stopped the band's surviving members from putting together J5, a clothing line inspired by the Jackson 5. Starting in the spring, the first collection will launch with items ranging from $32 T-shirts to $600 jackets. 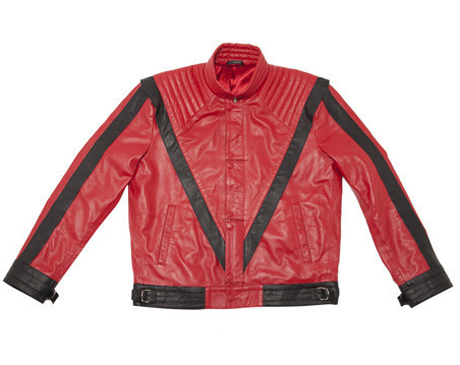 The jackets in question are recreations of ones that Michael Jackson wore in the videos "Thriller" and "Beat It," so they're essentially high-quality Halloween costumes. They are being made with the full participation of MJ's estate. In an interview with WWD [via the Huffington Post], Jackie Jackson compared the line to Diddy's Sean Jean collection and said, "The jackets are incredible. They are the real thing. I didn't really think of them as tributes to Michael in the beginning, but that's what they are. They represent everything he stood for and everything he's done in this industry, 100 percent." Apparently, preparation for the line started just a week after Michael's funeral in July 2009. Future plans include footwear and glasses. Jackson's family are behind the J5 clothes, but the same can't be said for the posthumous collection Michael, as MJ's mother has claimed that it's not her son singing on a number of the tracks. Jackson to play New Year's gig?